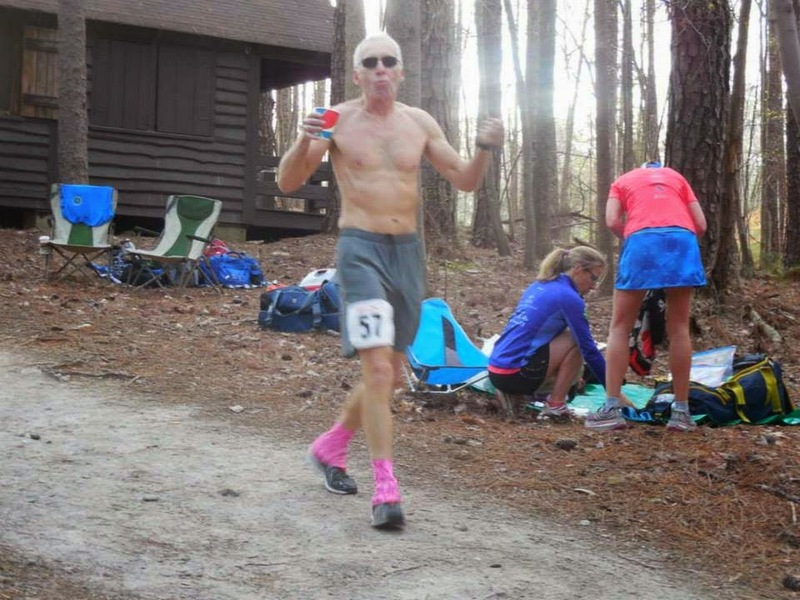 runjoey: Umstead 100 2014 AKA the Big PR ! Umstead 100 2014 AKA the Big PR ! My previous pr was 23:15 set way back in 2007 At Rocky Raccoon. Some setbacks and injury in 2008 along with burnout from racing too much and it would be 2011 before I would run and finish another 100 but the races and courses were very tough and not conducive to pr attempts ! By 2011 my training was better than it had been for years and actually the highest mileage averaged consistently of my running life. I began to believe that even in my mid 50's, a time when improving is not suppose to happen that I had a 100 mile pr in me. I just had to find the right day on the right course under the right conditions. 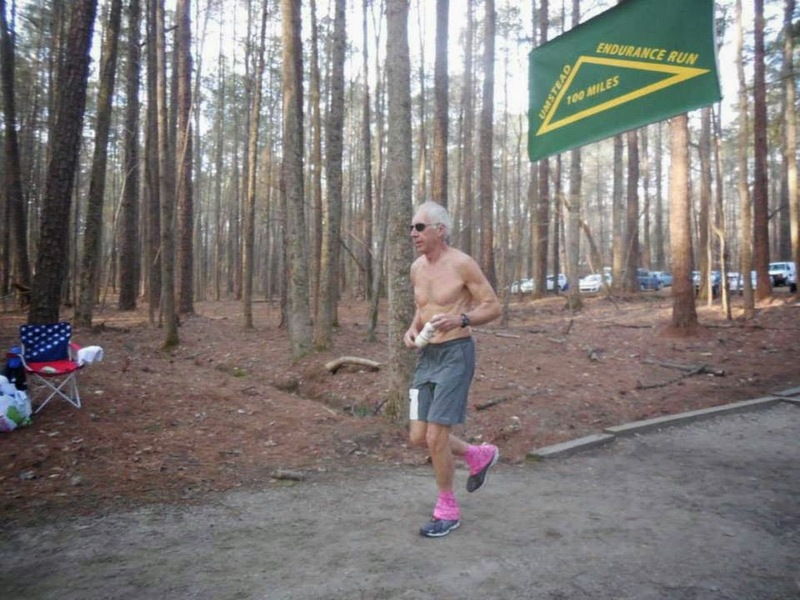 I chose to make that attempt here at Umstead in 2012 and was running quite well and on pace through 50 miles but the weather was too warm and humid and on lap 5 I really began to suffer. I would have dropped but for the first time I was going to use a couple of my Angels, Lisa and Karla as pacers and I didn't want to miss out on sharing it with them. Those last 2 laps were a sufferfest and I am so glad I had them with me and that put up with me when I was at my worst. A year later in 2013 it was time for another attempt at a race to remain nameless. I was well under pace and feeling great physically but it was a very screwed up situation and I dropped at 50 miles in what was a 50 mile pr at the time. Two weeks later I attempted at FA style 100 with some friends to run with me but freakishly untimely heat and humidity de-railed that attempt so I set my sights once again on giving it a shot at The Beast of Burden 100. Another injury just two weeks before forced a dnf at mile 37.5 It was just not looking good for another pr as father time was ticking away. But the training was still going great after the injury finally healed and it was time for one more shot at Umstead this year. I knew I was fit and ready and was just praying for good weather so I could have a legitimate shot at it. Race morning was actually warmer than expected but the humidity wasn't bad and the forecast was for just some slight warming during the day and really nice night time running so it was on. My mantra for the day would be " This is my Day ! Of course my goal was a pr but I had a fantasy goal of running 21hours and had a pacing plan that would get me there. Once again I was looking forward to sharing the day with some of my training partners, the Angels. I began the race in a singlet due to the warmer upper 60's start but brimming with confidence. I've done literally dozens of practice laps over the years and know every spot along the course and how long I will cover it at different efforts and walking strategies so I felt sure I could hit my planned lap times at least for the early laps. By 2 miles I was warmed up and in the groove enjoying the morning. The pace was dialed in and the plan was a go. I had a few nice conversations in the first lap and met a couple of new people. On Turkey creek I crossed Amy's "smelly bridge and with the damp cool morning air it was nice and smelly and with it some good memories of many miles shared in the park. The remainder of the lap was uneventful, I was feeling great and I nailed the pace I had planned which was a 2:10 start. I slammed a kellogs protein drink, took off the shirt, grabbed my sunglasses and then went through the aid station in about 1 minute and back out for lap 2. It was already warming as the sun was rising in the morning sky. I was feeling great and having a blast and continuing to run strong. It was wonderful to see so many friends running and volunteering all around the course and the support was amazing with so many kind words of encouragement. My plan was to run lap 2 in 2:20 and hit 25 miles in 4:30. Well, my 25 mile time was 4:30:02 ! I don't think it gets any better than that ! Once again I slammed protein shake and back in and out of the main aid station very quickly. Just some cheez-its for sodium and a little chocolate and I was on my way. The nutrition strategy was to just keep it simple and not over eat. I just don't handle "real" food in long ultra's unless I am going very slow and very hard like a mountain 100 that's going to take 30+ hours. I would repeat the same thing at the end of each lap and supplement with one or two gels each lap and just drink water and gatorade. Out on lap three and it was beginning to feel pretty warm for this un-acclimated runner. My main concern with the warmth was staying hydrated which can be an issue for me and also the stomach can go bad and not want to process calories when it gets too hot so I didn't want to push it but I wanted to still try and hit my splits. Some shade and a nice breeze in places kept it reasonably comfortable and I was able to maintain my strong running. My plan was for a 2:30 lap and I hit it once again dead on pace in 2:29:37 for a 6:59 37.5 mile time. In nearly every ultra of the 80 + over the past 12 years there has usually been a downtime somewhere around 30ish miles when things started to get a bit hard and I began to have doubts but today there was nothing like that. Just the normal little aches and soreness that come with pounding and pushing all the miles. I still felt great and was running strong but there were some spots out on the course that felt powerful warm in the sun. Just as I was coming down the final hill to the aid station I saw my friend Laura Frey. I would have loved to have her pace me a lap but as hard as she has trained for Boston it would not have made sense for her. I had hopes of repeating another 2:30 lap but I missed it. Yeah by a whole 2 minutes ! Mile 50 in 9:31 right where I wanted to be for the fantasy goal and feeling strong. I had hoped that the Trail Angel, Laura MacLean was going to be able to join the pacing team this year. I have hardly seen her the past two years as she has been in school and very busy. I contacted her a couple of weeks ago and asked if she might be able to find the time to run lap 5 with me. She said she would try and would confirm later. Well as of race morning I didn't hear from her so I assumed she wasn't coming so you can imagine when I came into the aid station that I was elated to see her ready to run. Shared a big hug and as always I was quickly back out to began lap 5. I told her I had allowed myself the luxury of slowing down another 15 minutes for this lap so we were able to relax and enjoy the beautiful afternoon as we ran and got caught up on whats going on in our lives. I was still feeling just amazingly awesome, running strong and no problems at all. This was certainly one of the most enjoyable laps I've had in this race and was sad for it to end in a way but I had another 3 to go ! Plan was for 2:45 and we were a little quick in 2:42 giving me a pr for a slightly long 100k of 12:13:38. I had been looking forward all year to having Karen Martin pace me on lap 6. We ran 11 miles last year during the race in between volunteering duties but a foot injury and practically no running all winter was going to make that impossible for her so I was on my own for lap 6. I put on a shirt and grabbed my light since the sun would be setting soon. I was still feeling better than I could have hoped for. I wanted to run another 2:45 lap and everything seemed to be working as I still ran strong. But it just seems that the pace slows down in the dark and although I was moving well, it was hard to push myself now out there alone and the pace fell below what I needed. I finished up in 3:01:50. It was a bit disappointing as the fantasy goal was now pretty much impossible but I was still feeling great and 100 % confident that a big pr was still in the bag. My dear friend and training partner Lisa Howell was waiting for me to head out on lap 7. She had done the same in 2012 during my sufferfest so I assured her it would be a different experience this time around. The plan for this one was 3 hours and I was just hoping I wouldn't lose anymore time. Once we got the airport spur she began pushing and I was just hanging on ! I was going to tell her to slow down but I was doing ok and I thought just maybe we could get some time back. Things were going great and we were slightly ahead of pace for the first 4 miles but then it got slower. I didn't even check any splits until we got to mile 10 of that lap and was quite a bit disappointed at how slow we were. I really felt like the effort should have produced a better result. A potty break cost me some more time and although we ran strong the last couple of miles we lost more time overall with a 3:12 lap. Karla THE Marathon Princess was waiting to bring me in the last lap once again. By now I was getting tired and the legs were feeling the effects of 87.5 miles of pounding on the hills but compared ot 2012 I felt like a million bucks. Karla saw me at my worst that year as I struggled through a most miserable 4:50 lap ! Lots of sitting, gasping moaning, groaning, whining and staggering that year and yet here she was ready to go out again this year. What real friends are made of ! Karla and I have shared thousands of miles together since we began training together over 9 years ago now and still every run is a wonderful time shared with great conversation. Things got pretty slow but she kept me going. I did take the luxury of sitting for about 3 minutes at aid station 2 while I waited for my drop bag and to drink one last protein shake. Other than that I had not spent more than 2 minutes in an aid station all day which can really save a lot of time. NorthTurkey Creek was a real time drain. It is amazing how slow your overall pace can be late in these things even when you keep moving and still run strong on the downhills. Karla gave me our split for mile 10 and I was hoping maybe I could squeak under 22 but at mile 11 it seemed it would be about 22:05. I just wasn't going to be content to let that happen with out a fight so we started pushing once we crested cemetary hill. There was no reason to hold back and save energy by now with just one mile to go and I was very happy that the body responded and I was able to crush that last mile and get the 21:58 and a new pr. Once you reach 58 years old and after running for so many years, things like that aren't suppose to happen. But it shows once again what a bit of passion for running, a strong desire to succeed and the will to put in the hard work along wiht a little luck and the support of some great friends can do. Dream Big my friends ! Thanks Sondra. I love the sport, the training and the people !